The story shared below is done so with permission given by the patient. This story was provided by the staff of DCI Cincinnati. 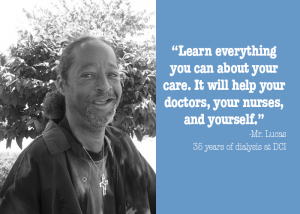 Mr. Lucas’ kidney disease story began in 1981, when he was 16 years old. He was an athlete—he boxed and played football. One day, during his freshman year in high school, he woke up with a swollen face and swelling in his hands. The swelling was the result of Nephrotic syndrome, a rare kidney disorder which caused his body to excrete too much protein and began leading Mr. Lucas down the path toward kidney failure. Mr. Lucas admits it was hard being healthy one day and then being sick the next. He was angry about it, but eventually realized that being angry just made him angrier. He realized he had to let it go. His mother helped him cope with Nephrotic syndrome by encouraging him to understand all he could about his illness and treatments. She did not keep his illness a secret. She emphasized structure. She treated Mr. Lucas and his brother equally, regardless of the illness. Eventually the illness did lead to kidney failure. In 1981, Mr. Lucas began receiving dialysis treatments at Dialysis Clinic, Inc. (DCI). When he started dialysis, he was dialyzed for eight hours, three times per week; eventually, this became four hours per treatment. He can vividly recall what dialysis was like 35 years ago, “The dialysis machines were like washing machines—four times bigger than the ones today.” Mr. Lucas continued, “They made a lot of noise, too. Back then, patients set up their own machines, calculated the amount of fluid to remove, put their own needles in, checked their own clot times, and administered their own heparin.” Mr. Lucas was on third shift, so he did his homework at dialysis, with the nurses checking his work. Within the last 35 years, Mr. Lucas has had two kidney transplants. His first transplant lasted from 1988-89 and his second lasted from 1993-94. He recalls at the time of his first transplant, patients stayed in the hospital for a month. Everything was kept sterile; staff wore masks and gowns when in the room. His transplant medications were Prednisone and Imuran. The Prednisone made him hungry all the time, and he gained almost 50 pounds. After the second transplant, the hospital stay was only one week, and they no longer required all of the masks and gowns to enter the hospital room. Patients were encouraged to walk laps around the hospital floor to walk a mile a day. Mr. Lucas recalls when Cyclosporine became available. Then, Mr. Lucas experienced his second transplant loss. He was informed that additional transplants were not an option due to antibodies that had built up in his body. Mr. Lucas returned to DCI to start dialysis again. Mr. Lucas has seen many changes in DCI and nephrology since 1981. He can recall five remodels and additions to the DCI unit. He remembers transplant nephrologists Dr. M. Roy First (and his nurse, Patti Weiskittel), Dr. Barcelli, surgeon Rino Munda, and a young resident named Shashi Kant (now Medical Director of DCI Cincinnati). He remembers a young Selwyn Hoodong and Lori Roberts when they started working at DCI. On a personal level, Mr. Lucas received a Hero graft, which is a new access option for his dialysis treatment.